The Eppendorf 5810R Refrigerated Centrifuge comes from a long lineage of reliable Eppendorf centrifuges with refrigeration to provide dependable cooling and speed you can count on. The Eppendorf 5810R is extremely flexible and offer powerful, with a maintenance free motor that allows researchers to focus on their research. The compact 5810R is high capacity, with a relatively small footprint, and is an ideal choice for multiple applications such as separating cell lysates, DNA precipitations, cell harvesting, micro centrifuge assays, and high-speed centrifugation. The temperature control in this refrigerated centrifuge ranges from -9°C to 40°C, with a FastTemp precooling function, and cooling that continues after the run has finished to help protect samples. 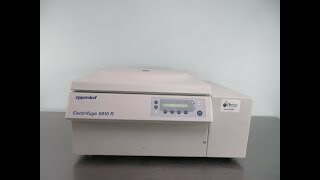 The Eppendorf 5810R Refrigerated Centrifuge has a top speed of 14,000 RPM (20,800 RCF), and features an ECO shut-off to automatically power down after 8 hours of nonuse to protect components. The Eppendorf 5810R can be used with a wide variety of rotors that can accommodate 1.5ml tubes, 50ml conical tubes, PCR strips, microplate plates, just to name a few. There are 18 different rotors to choose from allowing end users flexibility to meet their needs. This quiet operating centrifuge includes an Eppendorf F-34-6-38 Fixed Angle Rotor. One of the best features the Eppendorf 5810R offers is automatic rotor recognition which senses the rotor type and sets the maximum allowable speed, ensuring safety. In addition, the 5810R offers 35 user defined programs, 10 acceleration and braking modes. This Eppendorf 5810R has been fully inspected and reached top speeds and temperatures without issue. All of our lab equipment comes backed with our standard warranty. Should you have any questions, please don't hesitate to contact us.